Succulent offers a great take on tapas in Barcelona. Upon entering this totally renovated space that has been only open since 2012, the ambiance of the darkened restaurant is reminiscent of sitting down in a rustic inn that has been there for decades. Tables of varying heights are topped with planks of distressed wood, complemented by old wooden cabinetry on the floors and walls, which have been painted a deep pine green. The lively room is intimate with only six tables on the first floor. A second floor balcony loft offers additional seating at a long dining table attached to the wall. At lunchtime, the bar is buzzing with diners who are ordering beer and ordering tapas. N.B. Before you eat, make sure you wash your hands in the charming lavatory, where old pots are reincarnated as sinks. Like the sinks, the menu at Succulent emphasizes traditional Catalan recipes handed down for generations but that have been modernized with a young chef’s sense of creativity and whimsy. The talented young chef, Antonio Romero, hails from Valencia and has impressive credentials having previously cooked at El Bulli in Roses, Girona and Arzak in San Sebastian. The menu reads, Casa De Menjars (home-cooked meals), and the name of the restaurant, Suculent (succulent, in English), is a double-entendre, playing on the Catalan term sucar lent, which translates as “slow dipping.” Like the foods cooked by one’s mother, the chef hopes you’ll savor the tastes and be tempted to dip a chunk of bread in any leftover broth or sauce until the plate is clean. Succulent is one of a family of nine successful restaurants owned and operated by Catalonian Chef Carlos Abellan. Most of the diners here are locals—tourists are likely to arrive by recommendation. We sought out the restaurant after it was highly recommended by an assistant to Chef Albert Adria. Even though an English-version menu is available, ordering may be a bit daunting to those who aren’t adventurous eaters and/or familiar with Catalan cuisine. Fortunately, the friendly, attentive waiters speak some English and are eager to help. The small plate (tapas) menu is divided into starters (both hot and cold) followed by dishes from the sea, the mountains and a mix of the two. A section of the menu labeled Casseroles offers the possibility of three different tasting menus (The Little One, The Medium One, and The Big One, ranging in prcie from 50-70 euros per person). The Little One offers 10 different plates of tapas alone. Any time we’re in Barcelona, we come for a fix of pa amb tomàquet, toasted bread rubbed with tomatoes, olive oil, garlic and salt. This one was superb. 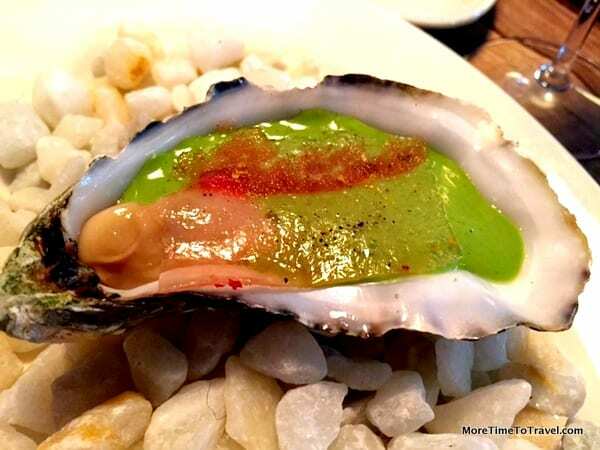 For our first dishes, we ordered an oyster ceviche cured in citrus juice and served on the shell, and a grilled oyster smothered in a pistachio cream. For our second courses, we ordered a tasty dish of white beans with Iberian pork jowl and a poached egg. The waiter suggested that we break the egg and mix it with the other ingredients. We also had one of the chef’s signature dishes, a savory steak tartare served over grilled bone marrow and topped with small potato pillows and fish roe. Again, the waiter suggested that we mix the flavors of the various ingredients. With two glasses of local Cava (3.50 euros per glass), we were totally satiated until the waiter suggested we try some dessert. It would have been a grave mistake to have missed either of these memorable desserts, high points to an already great meal: A delectably light and airy Brie cheesecake topped with Muscadel jelly, and truly succulent strawberries stuffed with cream, served on a bed of rose petal gel. The restaurant is located in an up and coming, culturally diverse neighborhood within the old town, Rambla del Raval. Buildings were demolished to create a wide-open, treed street for strolling that is lined with small shops and ethnic restaurants. Although it’s a bit off the beaten tourist path, Suculent is well-worth seeking out and adding to any curated Barcelona restaurant list. We loved the mix of traditional and modern, so reflective of the people and culture of Barcelona. Our meal was delicious, beautifully presented, and reasonably priced given its quality. You can bet we are going to return to sample other dishes on the menu. We may even go for the Big One! Our lunch tab for two totaled just over 50 euros. Because the restaurant is tiny and popular, be sure to make reservations online, in advance. Barcelona was a port stop on our Regent Seven Seas Celestial Sojourn cruise from Lisbon to Rome. Your visit to Suculent looks absolutely amazing. The Catalan flair with food is so darn fun. I love that section of the city, too — so relaxing and pleasant to walk there in the trees. Thanks for your always great reviews. Your Cavas and Castles Trip sounds awesome, Josie! Your pictures and write-up about Suculent Casa de Menjars make me want to visit there soon! How do I share this article on Facebook? I was able to click “Like” but I don’t think I shared it on my Facebook feed. You can just copy the URL for the page and paste it in your status bar on Facebook! You are making me drool. This sounds fantastic – I’d love to return to Barcelona, and when I do, I must go here! Wish we could go together, Sheryl! Your photo images are always so enticing and artistic.